The piano is a great introductory instrument for toddlers! Thus we thought it would be cool, to share a short list of the best toddler pianos on the market today so that you can kick-start your child’s musical involvement in a fun, educational, and affordable way. The Melissa and Doug Learn-to-Play Piano is a perfect example of an introductory musical instrument for kids. It features a total of 25 keys with full octaves and utilizes a brightly colored design that will surely capture the attention of toddlers. It also comes with an illustrated songbook to help children learn how to play popular nursery rhymes in the piano. The overall construction of this toddler piano is quite impressive with an absence of having sharp edges making it child-safe. 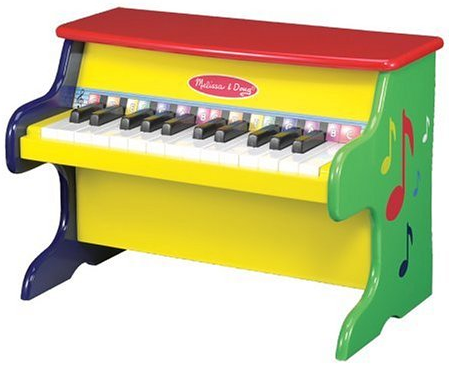 The overall size of this toddler piano is 11.5” x 15.75” x 9.5” (H x W x D) once assembled making it a relatively lightweight and compact piano for kids. This one has a grand piano design which is quite nice especially for children who are already in love with playing the piano. It features 30 keys and has a glossy finish to its hardwood body. It is impressively like a miniature grand piano. 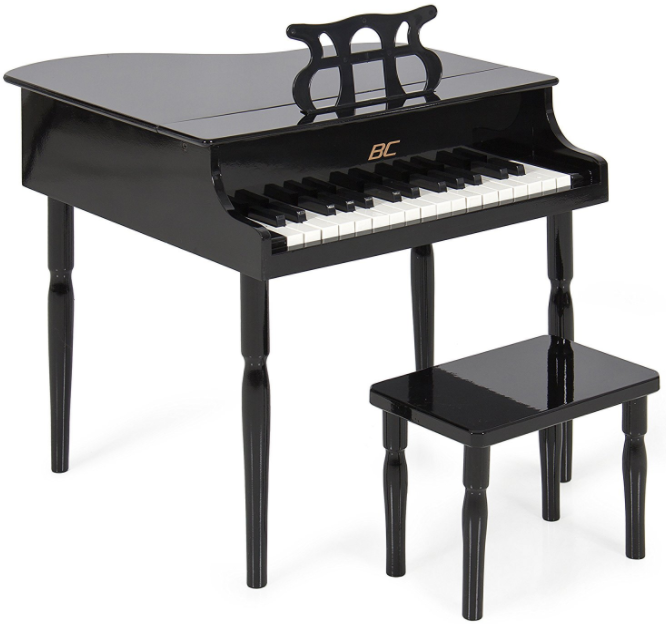 The set also includes a stool and a musical note holder to truly capture that grand piano aesthetics. This can be a nice make-believe toddler piano for your kid. This piano comes in with a dimension of 17” x 20” 20” (L x W x H). One thing I can say about the Musical Electronic Keyboard from Best Choice Products is that it definitely knows how to present itself. 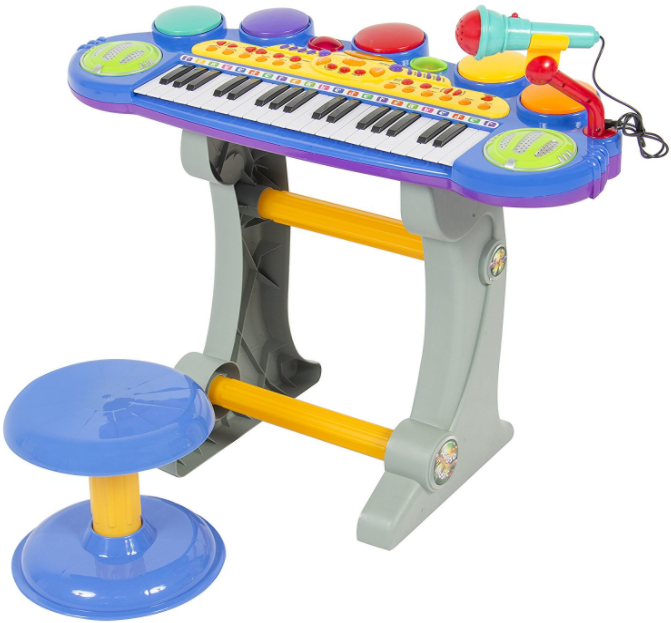 The stylish toddler piano comes in bright color combinations and even has a working microphone for good measure. It features 37 keys and the whole keyboard lights up with a variety of flashing colors as you play it. Your child can choose between 8 different instrument sounds from the piano to the violin. It also comes with audio recording and playback capabilities. The piano comes in at a relatively compact 11” x 24” x 24” (L x W x H) size. The Schoenhut 25 Key earn its moniker of “My First Piano”. It is an educational and fun way to introduce your child to this musical instrument and to music in general. It is designed to encourage creativity in regards to music and improves hand-eye coordination as well. This toddler piano comes with several helpful features such as the play-by-color method that allows toddlers to learn how to play music in a fun manner. Another great toy piano to nurture a child’s creativity and develop their hand-eye coordination. 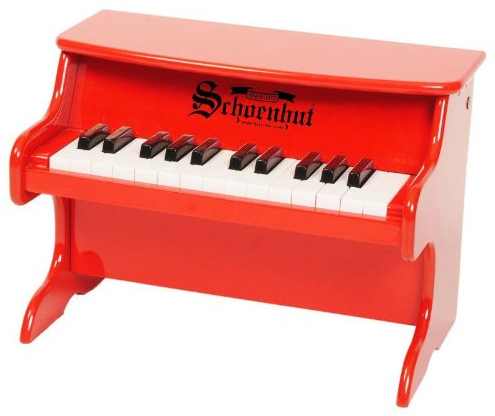 The Schoenhut also uses their patented Play-by-Color learning system which helps make playing the piano a fun yet challenging activity for children. It also has an adjustable design which allows longer shelf life as your child grows. It also comes with a companion bench. This is designed to be played by children ages 3 and above. 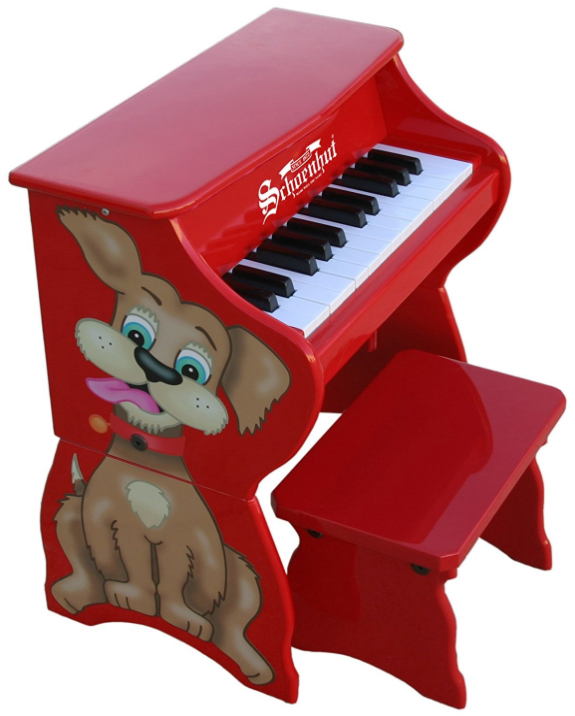 The toddler piano comes in at a dimension of 17” x 12” 12” (L x W x H) making it one of the more compact toy pianos in the market. Visit the original article as published on armchairempire.com to see the reviews.